The Republic and Canton of Geneva (French: République et canton de Genève; Arpitan: Rèpublica et canton de Geneva; German: Republik und Kanton Genf; Italian: Repubblica e Cantone di Ginevra; Romansh: Republica e chantun Genevra) is the French-speaking westernmost canton or state of Switzerland, surrounded on almost all sides by France (Auvergne-Rhône-Alpes). 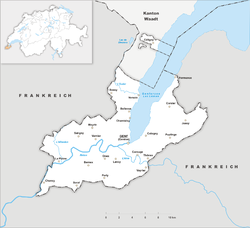 As is the case in several other Swiss cantons (canton of Ticino, canton of Neuchâtel, and canton of Jura), this canton is referred to as a republic within the Swiss Confederation. The canton of Geneva is located in the southwestern corner of Switzerland and is considered one of the most cosmopolitan areas of the country. As a center of the Calvinist Reformation, the city of Geneva has had a great influence on the canton, which essentially consists of the city and its hinterlands. Geneva was controlled by the Allobroges tribe until 121 BC. It was annexed to the Roman Empire in 121 BC and remained part of it until 443. In 443, Burgundians took over Geneva. In 532, the land controlled by Burgundians became part of the Frankish Empire. Geneva became a part of the Kingdom of Burgundy in 888. Geneva became a part of the Holy Roman Empire in 1032 and officially remained in it until the Peace of Westphalia. The Prince-Bishopric of Geneva was a Prince-Bishopric of the Holy Roman Empire from 1154, but from 1290, secular authority over the citizens was divided from the bishop's authority, at first only lower jurisdiction, the office of vidame given to François de Candie in 1314, but from 1387 the bishops granted the citizens of Geneva full communal self-government. As from 1416, the Dukes of Savoy attempted to annex the city, both by claiming secular authority and by installing members of the Savoy dynasty as bishops, the city sought assistance in allying itself with the Old Swiss Confederacy. The Republic of Geneva was proclaimed in 1541, under John Calvin, and given a constitution (Édits civils) in 1543. The Republic of Geneva reinforced its alliance to the Protestant cantons of the Swiss Confederacy, becoming an "everlasting ally" in 1584. The French Revolution reached Geneva in 1792, and in February 1794, the Republic gave itself a new, revolutionary constitution which proclaimed the equality of all citizens. After the death of Robespierre in July of the same year, there was a counter-revolution, which gained the upper hand by 1796. Robespierre's death prompted the French invasion of 1798, and the annexation of Geneva which became the capital of the French département du Léman. The Napoleonic army left Geneva on December 30, 1813, and on the next day the return of the Republic (Restauration de la République) was proclaimed. Geneva finally joined the Swiss Confederation in 1815 as the 22nd canton, having been enlarged by French and Savoyard territories at the Congress of Vienna (see Restoration and Regeneration). The area of the canton of Geneva is 282 square kilometers (108.9 sq mi). The canton is surrounded on almost all sides by France (Auvergne-Rhône-Alpes) and bordered by the Swiss canton of Vaud on the northeast. The adjoining French départements are Ain (to the north) and Haute-Savoie (to the south and east). The current boundaries of the canton were established in 1815. There are 45 municipalities in the canton (As of 2017[update]). The constitution of the canton was established in 1847 and has, since then, been amended several times. The cantonal government (Conseil d'État) has seven members, who are elected for four years. The legislature, the Grand Council (Grand Conseil), has 100 seats, with deputies elected for four years at a time. The last election was held on 7 October 2013. In a similar way to what happens at the Federal level, any change to the Constitution is subject to compulsory referendum. In addition, any law can be subject to a referendum if it is demanded by 7,000 persons entitled to vote, and 10,000 persons may also propose a new law. The Republique and Canton of Geneva has 11 seats in the National Council. On 18 October 2015, in the federal election the most popular party was The Liberals (PLR/FDP) which received three seats with 20.5% of the votes. The next two most popular parties were the Social Democratic Party (PS/SP) with also 3 seats (19.9%), followed by UDC/SVP with two seats (17.6%), and the Christian Democratic People's Party (PDC/CVP) (12.1%), Green Party (PES/GPS) (11.5%), and the Geneva Citizens' Movement (MCG) (7.9%) each with one seat. In the federal election, a total of 106,852 votes were cast, and the voter turnout was 42.9%. On 8/16 November 2015, in the federal election, Councilor Liliane Maury Pasquier, member of the Social Democratic Party (PS/SP), was re-elected in the second round as Conseillère des États of the canton of Geneva with a majority of 44,215 votes. She is part of the Council of States (French: Conseil des États) since 2007. Councilor Robert Cramer, member of the Green Party (PES/GPS), was re-elected in the second round with a majority of 42,075 votes. He is part of the Council of States since 2007. The population of the canton (as of 31 December 2017) is 495,249. As of 2013[update], the population included 194,623 foreigners from 187 different nations, or about 40.1% of the total population. The population of the canton, as of December 2013[update], contained 168,505 people originally from Geneva (35.4%) and 112,878 Swiss from other cantons (23.7%). About 73% of foreigners came from Europe (EU28: 64.4%), 9.1% from Africa, 9.0% from the Americas, and 8.5% from Asia. Including people holding multiple citizenship, 54.4% of people living in Geneva held a foreign passport. In 2014, the predominant language of Geneva was French, spoken by 81.04% of the population at home; the next largest home languages were English (10.84%), Portuguese (9.89%), Spanish (7.82%) and German (5.32%); respondents were permitted to report more than one language. 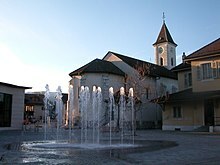 As home of Calvin's Reformation, the canton of Geneva has traditionally been a Protestant Christian stronghold. However, over the latter part of the 20th century, the proportion of Roman Catholics (220,139 people or 44.5% as of 2017[update]) in the total population rose, in large part due to immigration from Southern Europe, and now they outnumber members of the Swiss Reformed Church (65,629 people or 13.3% as of 2017[update]) in the canton by far; there has also been an increasing tendency in the Swiss population toward becoming religiously unaffiliated. However, the canton is still officially considered Protestant. The surrounding regions of France are mostly Roman Catholic. In 2012, 5.4% of the Genevan population (aged 15 years and older) belonged to other Christian groups, 5.5% were Muslims, and 5.9% belonged to other religious groups. The remainder of the population was religiously unaffiliated or did not answer the census question. The city of Geneva dominates the economy of the canton. It is a center of commerce, trade and finance. Geneva is of international significance also as a financial center. A great number of Swiss banks are located in Geneva, particularly in the area of private banking. The service industry is most significant in Geneva where there are headquarters of a number of international corporations and organizations, such as the United Nations and the International Labour Organization. Agriculture is commonplace in the hinterlands of Geneva, particularly wheat and wine. Precision machinery and instruments are other branches where the economy of the canton of Geneva is strong. This is also reflected in the tradition of watchmaking in Geneva. Most of the main roads in the canton of Geneva radiate from the capital city of Geneva. Of these main roads, a great number lead into France rather than any other Swiss canton. The canton is served by an international airport at Cointrin (Geneva International Airport), which has one terminal only. There are many railway services including commuter, intercity regional, and international mostly originating from Geneve Cornavin Station in Geneva. The services are operated by the Swiss Federal Railways, SNCF (France's national rail), and Trenitalia. Since 1984 the French high-speed trains (TGV) come to Geneva. In 1964, the canton of Geneva was connected to the Swiss highway system and in 1970 to that of France. The main educational institution is the University of Geneva, founded in 1559 by Calvin. It was originally called Schola Genevensis. The original buildings are not used by the University any longer, but by Collège Calvin. The Jeûne genevois is a public holiday specific to Geneva, celebrated on the Thursday following the first Sunday of September. L'Escalade, or Fête de l'Escalade (from escalade, the act of scaling defensive walls), is an annual festival held in December in Geneva, Switzerland, celebrating the defeat of the surprise attack by troops sent by Charles Emmanuel I, Duke of Savoy during the night of 11–12 December 1602 (Old style). The celebrations and other commemorative activities are usually held on 12 December or the closest weekend. ^ "Liste officielle des communes de la Suisse – 23.03.2017". Office fédéral de la statistique. Retrieved 27 November 2017. ^ "Grand Conseil: Partis politiques" (official site) (in French). République et canton de Genève. Retrieved 30 October 2015. ^ "Election du Grand Conseil du 6 Octobre 2013" (official site) (in French). République et canton de Genève. 6 October 2013. Archived from the original on 24 September 2015. Retrieved 30 October 2015. ^ "Canton de Genève, Conseil national, 11 Sièges" (in French, German, and Italian). Neuchâtel, Switzerland: Swiss Federal Statistical Office. 18 October 2015. Retrieved 28 October 2015. ^ "Council of States - Results: Geneva". Swiss Federal Confederation. 8 November 2015. Retrieved 28 October 2015. ^ "Kirchenmitgliedschaft in der römisch-katholischen und evangelisch-reformierten Kirche nach Kantonen (2017)" (Table 1.4 on the lower part of the page) (in German). SPI St. Gallen. 2018. Retrieved 21 March 2019. ^ "Statistiques cantonales – Les 21 domaines: 01. Population – Langues et religions" (official website) (in French). Geneva, Switzerland: StatistiqueGenève, République et Canton de Genève. August 2014. Retrieved 8 December 2014. ^ "Languages and religions – Data, indicators: Religion" (official website). Neuchâtel, Switzerland: Swiss Federal Statistical Office. 2014. Retrieved 8 December 2014. Wikimedia Commons has media related to Canton of Geneva.